More adults and children are getting clear braces as a trend to fix teeth increases in Australia. Gone are the days when teenagers used to dread if they were told to wear braces. But today it seems parents are struggling to hold their children back from the orthodontist’s chair and surprisingly adults are joining in as well, flocking to fix their crooked smiles. Orthodontists have given the credit to the new technology like clear braces, which has made orthodontic work a more subtle and faster process. The treatment can help you achieve the smile that you have always wanted. Clear braces are virtually invisible; in fact, most people will not even notice that you are wearing one. For adults, clear braces allow them to avoid the negative stigma that comes from having metal braces in the mouth. For young wearers, metal braces become a source of embarrassment due to how they are viewed, treated and teased by their peers. The invisible aligners remove all of these issues and still straighten teeth. The main advantage of Invisalign clear braces over metal braces is that they are comfortable to wear. Metal braces tend to become painful over time and with ongoing adjustments, they sometimes become a distraction because of occasional pain. Invisalign may cause minor discomfort as teeth move into proper position, but are far more comfortable and effective. Orthodontic clear braces are removable, which you can eat and drink what you want during treatment as well as brush and floss normally. Invisalign aligners are trays that are fitted to be worn on your teeth over a period of time. You receive a series of trays over the course of your treatment. You can remove them at any time. Conversely, metal braces are installed and remain in place until they are removed by an orthodontist. Oral health is significantly improved with the use of Orthodontic clear braces because you can remove the Invisalign trays whenever you wish. With metal braces, keeping your teeth clean can become a major chore. Plus, the incidence of tooth decay and other oral infections is higher with metal braces. This is not an issue with Invisalign products. As the trend of smiling selfies continues, the journey to picture perfect teeth begins with a trip to the dentist, all thanks to clear braces. Straightening your teeth is a surprising method you can improve the way you feel about your appearance. There’s no need to feel ashamed of that ‘unwanted’ gap anymore. With almost invisible braces you’ll be able to smile for a camera without holding back. 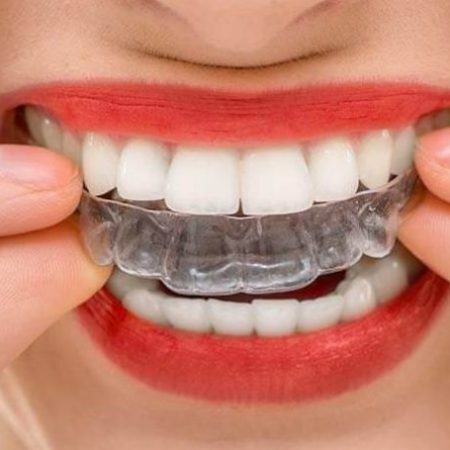 Invisalign clear braces are clearly the best orthodontic treatment as they realign your teeth easily, painlessly, are virtually invisible and are simple to use and clean. All you have to do is contact the dental professionals at Tooth Booth for your appointment to discuss if these orthodontic clear braces are right for you. Once you and our Dentist establish Invisalign or ClearCorrect is the right treatment option for you, your treatment will get started. When there is a dental care emergency, visiting the wrong dentist is the worst mistake you can commit. You never know when you will need to see an emergency dentist in order to get your teeth and gums cared for immediately. You need emergency dental care for toothaches, cracking fillings, swelling of gums, chipped tooth, and other dental problems. In such situation you tend to go to the first dentist you find to get rid of that unbearable pain. If you get low-quality dental service, you may end up losing your teeth and the problem would get larger and even more dangerous in future. You would be spending a lot of money without getting any actual help. This is not the only mistake people generally make; there are other emergency dental care mistakes that people commit time to time. A dental emergency can happen any time of the day or night. Emergencies are stressful and people tend to make mistakes but with the right knowledge and information, you can avoid making common emergency dental care mistakes. We have already established that choosing the right emergency dentist is very important to your oral health in the long run. Ideally, you should have your own dentist whom you can contact at any time and get help. However, if your dentist cannot offer you immediate dental services or is unavailable most of the time, finding a local dentist could be the best option to help you in case you have an emergency dental problem. If you are looking for an emergency dentist in North Brisbane then you don’t have to go anywhere, Tooth Booth emergency dentists are here to treat you anytime. People often either forget to make sure that their dental insurance covers related costs or forget their insurance card while visiting a dentist. If you have a dental insurance cover, it is advisable you inquire if the dental care provider is a member of your insurance company to be covered. You should not take a chance because your insurance cover may help you cut your costs. If the dentist is not a member of your insurance cover, consider fixing a price in advance to avoid spending more than you planned. This is one honest mistake most people make during emergencies. You would not bother to inquire about additional charges until they show up on the bill. Make sure you collect the information about additional charges before visiting the dental service provider. To avoid last-minute fees, ask your dentist the total amount you need to pay in advance. Luckily, Tooth Booth offers dental payment plans that are simple and won’t charge you any interest in your treatment. Our dental payment plans cover all general dentistry, cosmetic dentistry and orthodontic treatments in Brisbane. Most people tend to avoid or postpone visiting a dentist in case of a dental emergency as they do not consider it a serious health problem. But, remember when you postpone a dental emergency, you give a whole lot time for the germs to attack your teeth and spread the infection. You should be careful and prompt with dental emergencies as any dental condition can cause other diseases. First of all make a habit of visiting your dentist on a regular basis, so that there would be fewer chances of any dental emergency. And if you are in a dental emergency then do not take the risk of postponing your visit at any cost. Tooth Booth has a team of professional and qualified dentists, who will always strive to respond to your emergency as fast as possible. We know emergency can happen anytime, that’s why we keep appointment available every day for patients requiring a Brisbane emergency dentist. If you are in need of an emergency appointment, please contact us or directly come to our Tooth Booth Dental lounge Chermside, Tooth Booth Dental Lounge Carindale, Tooth Booth Dental Lounge Indooroopilly and we will treat you the same day.